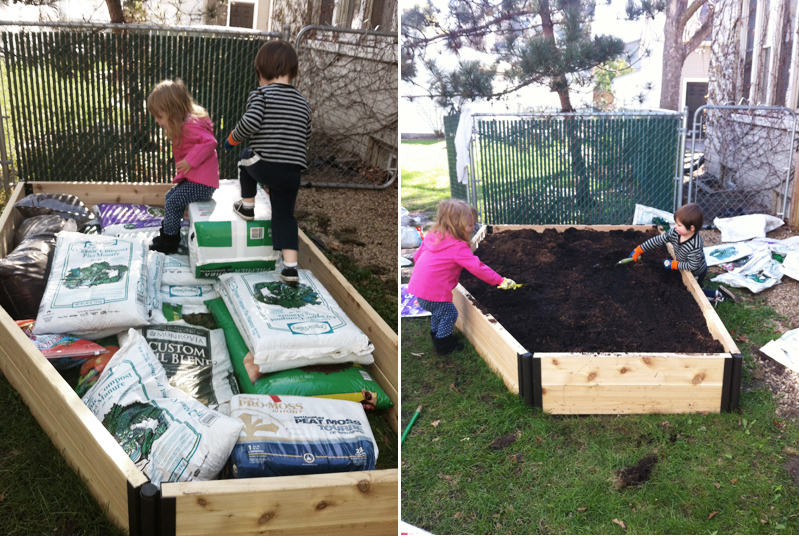 So it’s been awhile since I updated about you on the progress of our raised bed veggie garden. We built it a few weeks ago, and then began our dirt collection. I think in all we gathered 800lbs of dirt or something. Totally crazed I know. 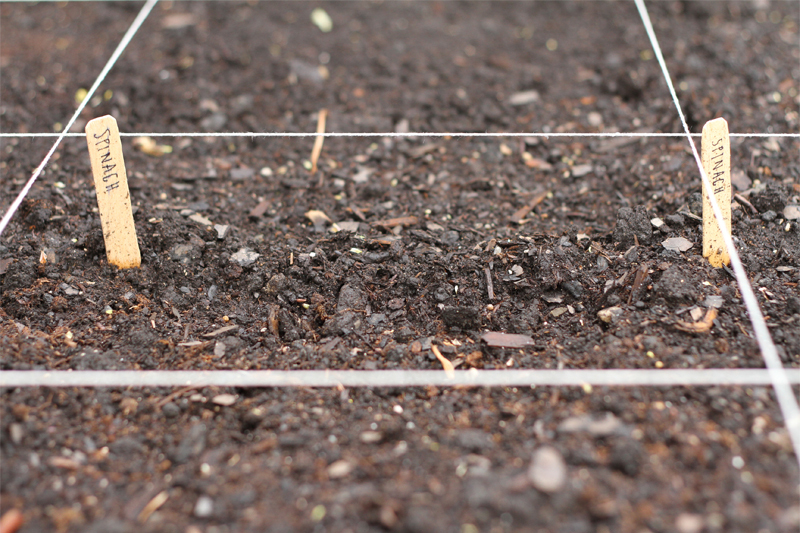 The square foot gardening method calls for a mix of 1 part compost, 1 part peat moss, and 1 part vermiculite. We improvised a bit. We got tons of different types of compost, manure, and a few bags of gardening soil, like Miracle Grow, that contained fertilizers. Not a lot of stores around these parts carry vermiculite so after getting some advice from our local nursery we decided to go with rice hull, something I had never heard of before. It’s similar to a cocoa mulch, but from rice instead of cocoa, obviously, duh. It’s not heavy and seems to help keep the soil light, which is the main purpose of the vermiculite. Finn and Elsa are becoming proficient little gardeners. Don’t know what they were more excited about; climbing piles of bagged dirt and poop or mixing it all up. Next step, our square feet of course. 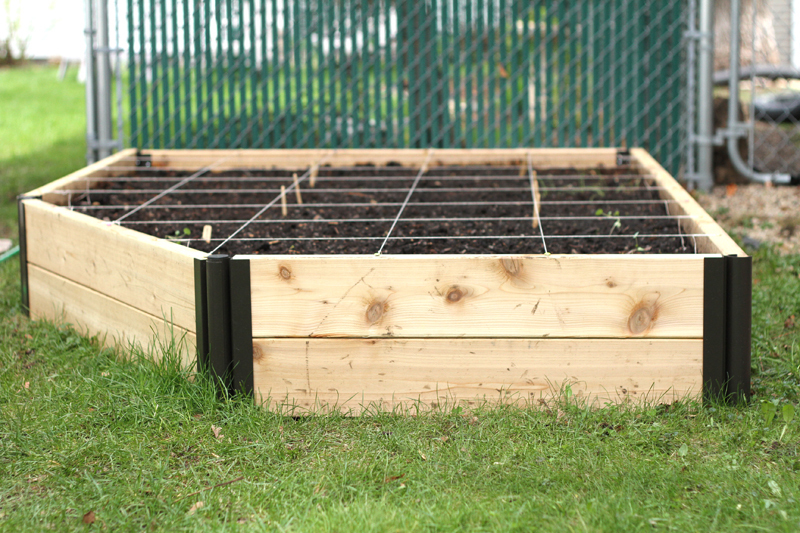 According to the square foot gardening method they recommend using a trellis like structure to grid off all your squares. I decided against that. Too much work. We instead used push pins and kitchen twine. We’ll see how it holds up, maybe the veggies will turn into bullies and ruin it all in the end, but it seems like a good and reasonable idea to me. 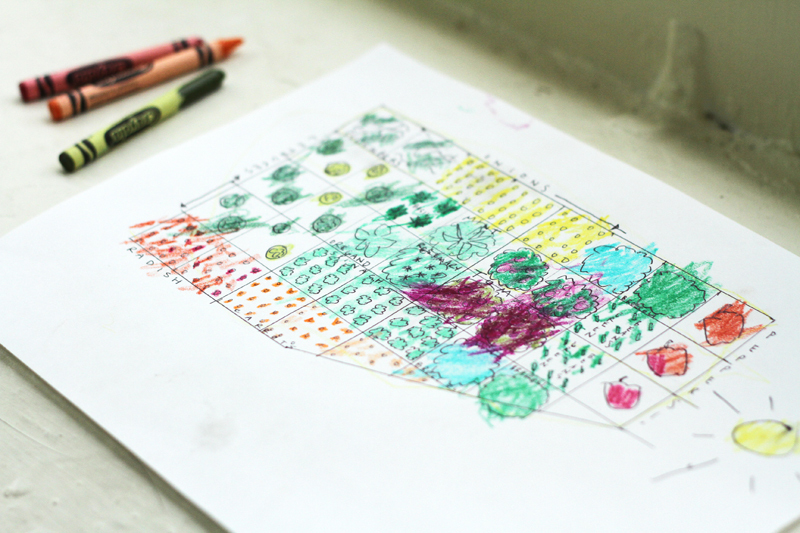 Earlier this week, Finn and I mapped out the garden and I started to realize how great gardening will be for the kids. First we learned how to use a ruler and gridded out the garden just like we did with the string. Then we got out our square foot gardening book and our list of seeds. We read about each and every veggie we were going to plant, figured out which need the most sun and which can handle a little shade and started plotting. Finn loved coloring and counting all the veggies. It was exciting for me to see him so excited about learning and planning. We haven’t even had our first harvest yet, and I feel our little garden has already been so rewarding. Sappy I know, but so true. Then yesterday we planted a few of our late spring crops. I gotta tell you, it didn’t feel right planting seeds in 45º weather but I guess it’s totally cool for the plants. So we preceded with our plan and planted Broccoli, Onions, Spinach, and 3 Varieties of lettuce. Next week it’s carrots and radishes, can’t wait! This is so great! Your son will have a great appreciation of what goes into producing food once you can pick it right out of your garden. Thanks! I really hope this gives him an appreciation for food and a life long love of gardening. 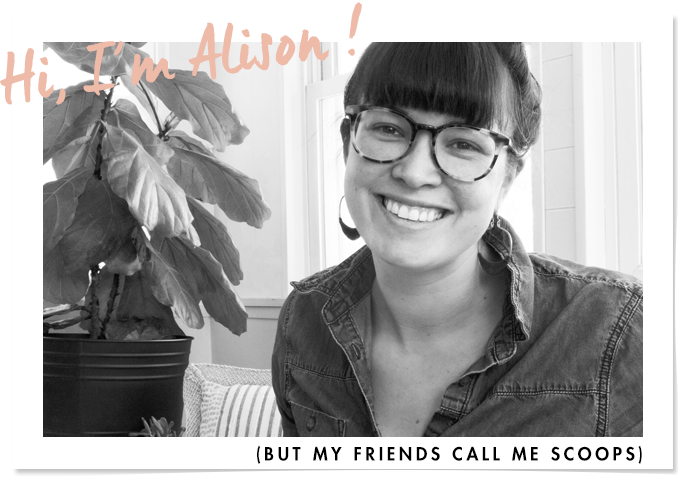 Hi Allison! Hope you don’t mind…I posted your blog on the LifeWays North America Facebook page. 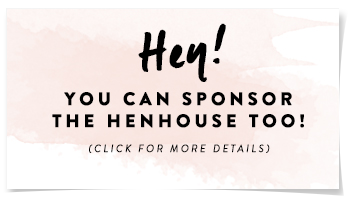 We’ve got lots of stay-at-home moms, home daycare providers, and gardeners who will love to see this! Nice job with the garden…can’t wait to see how it progresses! Thanks Mary! I’ve been enjoying seeing progress reports on your farm too. So inspiring and awesome!